Things are pushing forward regardless of being very busy preparing Granite Devices visit to SPS IPS DRIVES exhibition (welcome to Nurember, Germany on 26-28.11.2013!). Anyway, today I have uploaded the first pre-release of awaited SimpleMotion V2 library with a small example program. Download it, and find usage instructions from here. Official library release and more example programs will follow later on. New Argon servo drive firmware is under preparations. 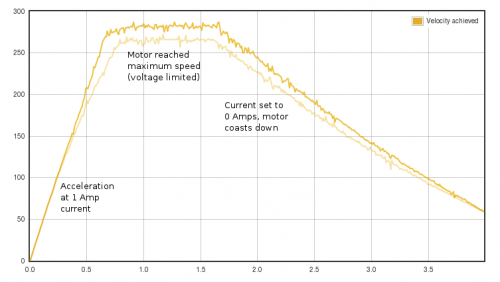 One of the improvements will affect to performance at high electrical commutation frequencies. High frequencies occur at high rotation speeds especially if motor magnetic pole count is high (more than 4). Performance change illustrated. 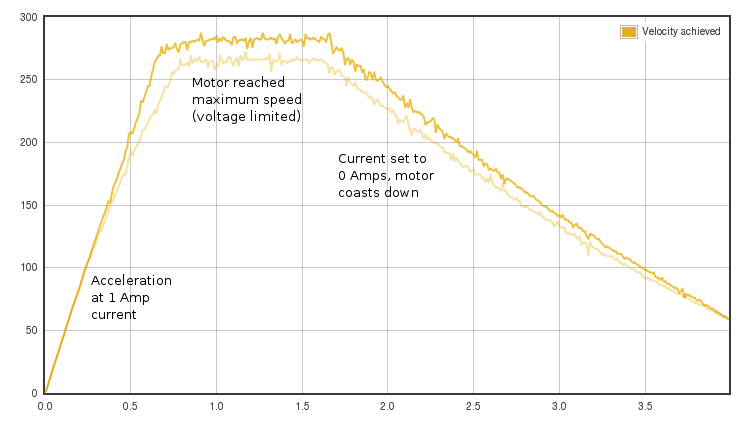 In this test motor was accelerated with constant 1 Amp current in torque mode before (the light yellow graph) and after FW upgrade (dark yellow). From the graph we can see how the new FW accelerates motor faster and reaches higher speeds meaning it delivers more torque at high speed region. The motor is a 300W Sanyo Denki P5. Before releasing it, we’re planning to implement also configurable motor braking control that will help people with vertical axes where gravity tends to pull unpowered axis down. Two more days left on introductory pricing of Argon. When it’s gone, it’s gone! On the other news, we’re today shipping the very first batch of products to a warehouse service located in London where they pack & ship the products around the world. This yields more consistent shipping response time, faster delivery method and reduced shipping cost at the same time! The fulfilment service has warehouses also in the US and Hong Kong where we may expand stocking later on. This would enable very low shipping cost and freeing from customs hassle from the US or Asian customer point of view. The service soon opens new warehouses also in Germany and Australia which makes things even better!